From the ethnic point of view is along the territory of the former USSR, the region most complex in Europe. Most countries of the Balkans still have not overcome the economic crisis that triggered the transition to a market economy in the nineties of the twentieth century. The Balkan region is located in South Eastern Europe. It consists of a set of very hilly country: its backbone are the Dinaric Alps in the west and the Balkans in the east. Not included in this package to Greece, linked geopolitically to Western Europe, Eastern Thrace and no, it belongs to Turkey, a country straddling Europe and Asia. In the Balkans, home to some 35 million people, representing only 5% of Europeans. The population is predominantly white, although there is ethnic variety because of its complex historical background The main religion is Christianity, both Catholic and Orthodox, but because of the Turkish rule in the past there are also many Muslims, especially in Albania, Bosnia-Herzegovina and Macedonia, which is an element of differentiation from the rest of the continent. 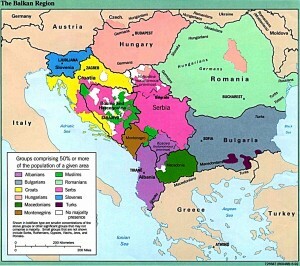 The political demands of the different ethnic groups, it is virtually impossible to draw clear lines of demarcation space are the main cause of the unending crisis in this region, which led to the breakup of Yugoslavia between 1991 and 1992, and then the conflict in Kosovo, an autonomous province in Serbia and Montenegro including, populated mainly by Albanians who demand independence, and since 1999 is monitored by a UN mission. The population of the region is concentrated in the valleys of the rivers belonging to the Danube and Adriatic side, and in the plains, which extend mostly along the coast, discontinuously. The mountainous areas are almost uninhabited. Zagreb (Croatia), Sarajevo (Bosnia-Herzegovina), Skopje (Macedonia), Ljubljana (Slovenia) and Tirana (Albania). From a demographic standpoint, the region is stagnant: the natural increase is reduced in volume to 0.5% in three countries (Croatia, Bulgaria and Slovenia), even the natural growth is negative, which means that the population is declining. The result is a progressive aging of the population in the Balkans: the number of people who are 65 years and now exceeds 15% in most countries of the region. In some countries, moreover, the infant mortality rate is relatively high (above 20 per thousand), due to poor health infrastructure. The Balkan crises of the 1990s caused millions of refugees and IDPs: In recent years, about 2 million people have returned to their homes, but many thousands still waiting to do so. In Bosnia-Herzegovina Serbia and Montenegro yen are two groups of IDPs outnumber existing in the world today, under the protection of UNHCR, nearly 600,000 people in total in 2004.
and have increased their exports to the EU. The main obstacles to normalization are political instability. corruption and organized crime. The primary sector still has considerable weight in the economy of this region, especially in Albania. Highlights farming and mining activities. Agriculture is practiced in the valleys, and the crops are the Mediterranean: cereals, grapes, olives and fruitage. Mining stands out because many of these countries (in spice! Bosnia-Herzegovina, Slovenia, Macedonia and Serbia and Montenegro) have abundant mineral resources: iron, lead, zinc, coal. The industry is on the whole, the sector that provides most of the revenue, and relies on the existence of rich mineral deposits.They focus on the main urban centers. Tourism was, before the wars of the nineties, an expanding activity in some countries (like Croatia and Slovenia), now tries to recover and promote. the northwestern region occupies about 20,000 km2. To the west with Italy, Austria and Hungary north and east and south by Croatia. It has an outlet to the Adriatic port of Koper on the Gulf of Trieste. It has just over 2 million people, most of which are Slovenian Catholic religion is a stagnant, aging population more than 18% of people aged 65 and older. 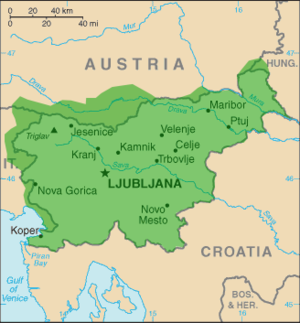 Hardly affected by the wars in the Balkans, Slovenia is one of the most developed countries of the region and enjoys a per capita income afta This is largely due to its location between the Dalmatian coast, Central Europe and the Balkans. Since 2004 a member of the EU. The industry contributes 40% of production, highlighting the advanced processing, which is concentrated in the capital and the cities of Maribor and Celje. The weight of primary sector in the economy is very small. Notable cereal crops, vineyards and orchards, especially in the high Saya Valley and its tributaries. The services provide almost 60% of the wealth highlights tourism, a growing activity that takes place on the coast and in the alpine Postojna Caves, southwest of the country, are considered the most important in Europe for its relief karst. Tags: Balkan countries. News. Information. Politic. Economy.